The Sony PXW-Z190 4K superb all-rounder is the de facto choice for a wide range of 4K and HD single camera shoots with an all-new 1/3-type 3CMOS sensor. A powerful 25x zoom lens with three independent lens rings delivers pin-sharp 4K imaging for almost any professional shooting scenario. Advanced Face Detection AF and Sony's unique Electronic Variable ND filter making shooting great content stress-free. Sony's familiar control layout and robust build quality make this a camera you can rely upon. It supports a wide range of formats including XAVC-Long, DVCAM, MPEG HD422/ MPEG HD* and Proxy 1080i. Dual SD slots, 3G-SDI output and Remote Terminal ensure it can support all workflow scenarios. 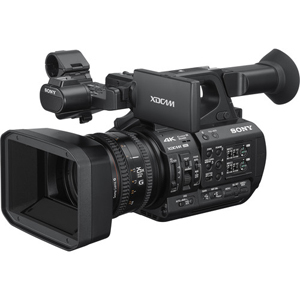 The Sony PXW-Z190 4K is the world's first professional camcorder with a 4K (QFHD) 1/3-inch type sensor. Red, blue, and green light are independently captured by separate image sensors within the Exmor RTM system in 3840 x 2160 resolution at up to 60fps. Even if you're delivering in HD, 4:2:2 10bit recordings will capture detail and image texture that HD sensors simply cannot see. The Sony PXW-Z190 4K is equipped with a 25x professional zoom lens able to zoom from 28.8mm to 720mm (35mm equivalent). The Sony PXW-Z190 1/3-inch type lens has three independent control rings, which allows manual control of focus, zoom and iris, making for better and faster adjustment. The Sony PXW-Z190 4K offers four channel audio recording with two independent volume dials enabling precision control of external audio inputs, including an MI-shoe attached microphone.